I am not sure why, but I feel the need to apologize for my overuse of mango in my recipes. In the spring, Rob will treat himself to a case (or 2!) of Alphonso mangoes and savour each one, unadorned, possibly over top his breakfast oatmeal. The King of Mangoes does not come cheap, though. They also make Rob a mango snob. At Sunny’s, they have 3 mangoes for a $1. They are not Alphonso, nor Ataulfo, rather the Tommy Atkins mango. I can’t help myself, though. 3 for $1! You will notice the difference if eating the mangoes raw (they aren’t as sweet nor as creamy and luscious), and Rob has no interest in eating them for breakfast. But for me, they are a guilt-less way to cook with the mangoes. This is my submission to Deb for this week’s Souper Sundays, to this month’s My Legume Love Affair, hosted by Preeti, to Ricki’s new Summer Wellness Weekends and to this month’s No Croutons Required featuring lentils. To this day, this is one of my favorite meals and I’m so glad you enjoyed it also! I think of all things to be a snob about, mangoes are perfectly rational. They are the most delicious fruit on earth, after all. i just looked through the first 7 pages of your vegan recipes. Every single one looks absolutely amazing. That green soup with ginger looks like it might become my new favorite soup! 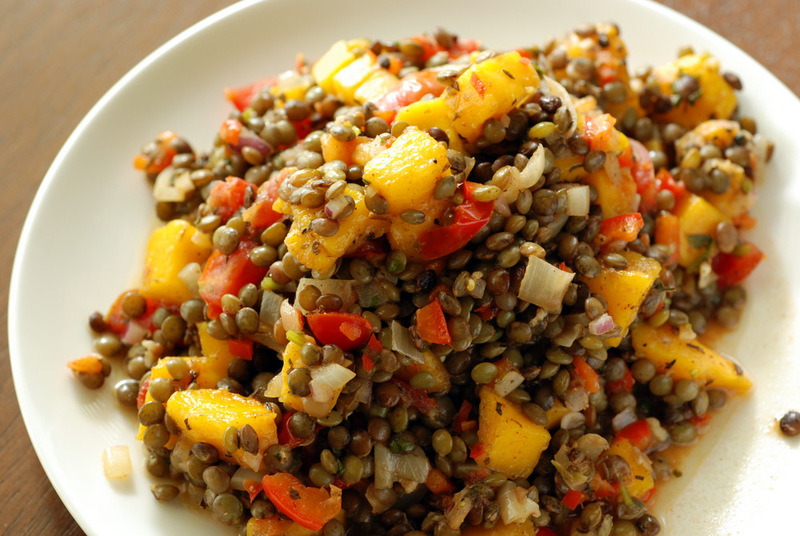 Mango and spice really brighten up the lentil salad! A deliciously sweet idea to use French lentils! 🙂 Indeed another great result of French Culinary excellence! 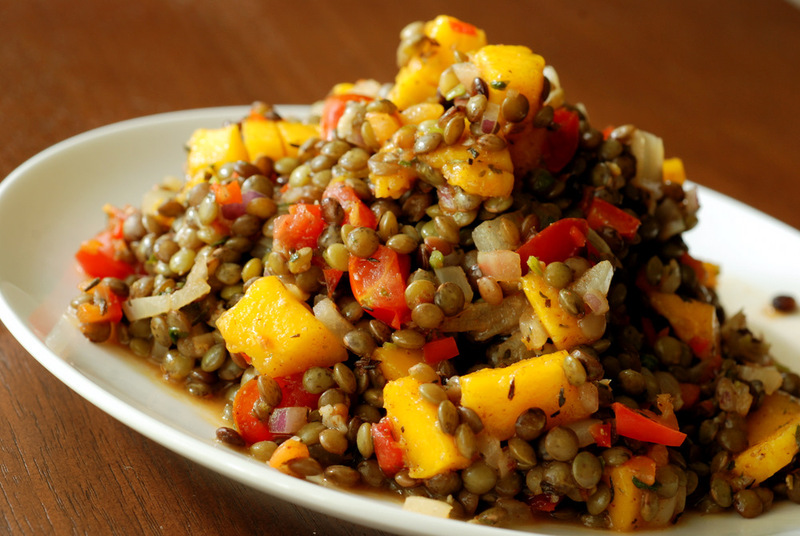 I’m always looking for new ways to spice up my lentils and I love mango so I will try this one soon! The spice combo sounds really good too! These lentils look full of flavour! Though I’m still a bit wary of fruit in my savoury dishes. I’m so glad you enjoyed the Thai coconut corn stew and the quinoa corn salad. 🙂 Let me know what other recipes you end up trying from Rebar and how you enjoy them! Hi, reached your blog through the MLLA round-up page. I grew up in India and there’s no such thing as ‘too many mangoes’ for me :D. I loved this combination of sweet and savory. We don’t get alphonso here (sigh) but will give this a shot next time I buy some mangoes!